Bus Simulator puts you behind the steering wheel of a traditional urban bus and challenges you to complete "missions", that is, complete any of the city routes that bus must follow. But Bus Simulator is not only a driving simulator, meaning you'll have to take care of the business by deciding the price of tickets or renting the vehicle's ad spaces to make them more profitable. Driving in Bus Simulator not as easy as it seems at first sight: not only you have to find your way in an unknown city (note you can open the map with the M key) but you also have to stop at every single bus stop in your route, open and close the doors and follow your way to the next one. Also, don't forget to respect road signs: I didn't stop for any red lights (too much GTA IV is seriously affecting my driving style, luckily only the virtual one) and got fired in about 5 minutes. Graphics in Bus Simulator are just fine; quite realistic, but certainly not the best ones I've seen. Physics is not very elaborate, especially when it comes to crashing against objects or other cars (hey, don't laugh at me: I'm not that bad at driving, I just have to test everything!). 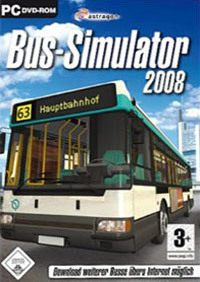 Other than that, Bus Simulator just an original game that seems as exciting as driving a bus in real life.